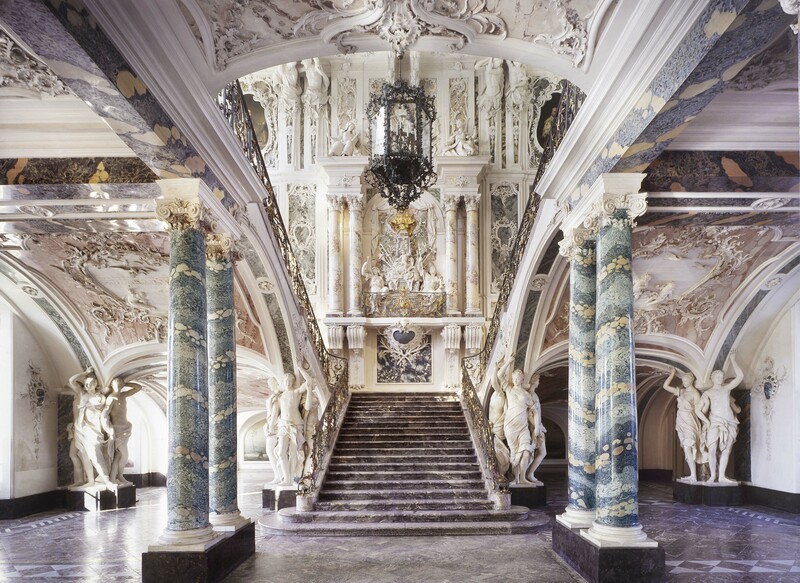 Augustusburg Palace represents one of the first examples of Rococo creations in Germany. For the Cologne elector and archbishop Clemens August of the House of Wittelsbach it was the favourite residence. In 1725 the Westphalian architect Johann Conrad Schlaun was commissioned by Clemens August to begin the construction of the palace on the ruins of a medieval moated castle. In 1728, the Bavarian court architect François de Cuvilliés took over and made the palace into one of the most glorious residences of its time. Until its completion in 1768, numerous outstanding artists of European renown contributed to its beauty. A prime example of the calibre of artists employed here is Balthasar Neumann, who created the design for the magnificent staircase, an enchanting creation full of dynamism and elegance. The magical interplay of architecture, sculpture, painting and garden design made the Brühl Palaces a masterpiece of German Rococo. UNESCO honoured history and present of the Rococo Palaces by inscribing Augustusburg Palace – together with Falkenlust Palace and their extensive gardens – on the World Heritage List in 1984. From 1949 onwards, Augustusburg Palace was used for representative purposes by the German Federal President and the Federal Government for many decades. In 1728, Dominique Girard designed the palace gardens according to French models. Owing to constant renovation and care, it is today one of the most authentic examples of 18th century garden design in Europe. Next to the Baroque gardens, Peter Joseph Lenné redesigned the forested areas based on English landscaping models. Today it is a wonderful place to have a walk. Today, the state of North Rhine-Westphalia maintains these palaces for the public as museums, preserving its status as an internationally renowned World Heritage Site.